My grandkids and I went to see Brave yesterday. Another spectacular Disney Pixar Production. I don’t know about you, but Pixar absolutely draws me in and I begin believing these little munchkin characters are real people! 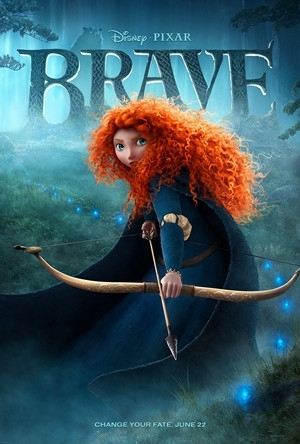 The movie is set in a “tribal” Scotland – Merida, the beautiful red-haired princess is about to be married to one of the tribal men – the one who can win her with their skills. Merida, a spicy young miss will have no part of that and she challenges the old custom. There is some magic, a spell is cast on Merida’s mom – a spell which only Merida herself can break. It all ends well for Merida, her lovely Queen mum, her barbaric-looking King dad, and her impish triplet brothers. And, with any movie, one can bring spiritual discussion to the forefront with your children. Ah… perfect setup for my ‘drive home discussion’. We’re all settled in the car, seatbelts buckled, wipers on, lights on, heading out of parking lot. There are lessons in everything – and even a Disney Pixar movie with some black magic thrown in can be used for His honor and His glory! I love your review, Susan! Thanks for sharing it with us. I was a tad-bit undecided on if I should take my almost 5 year old to see it. He loves Disney/Pixar films (so do I) but I wasn’t sure if I should see it first. I may consider it. And I totally agree with you. We can find a lesson in everything— a way to share of God’s grace. I loved how you did that with your grand-babies! Good job Sus……..as usual! Now, I want to see the movie…but Kim and Tim already took the kids….and Steve won’t go……so thanks for the review! And good job on that last sentence! omg hey mimz gosh we are so coooool. ppffft pffft. you’re grrrr-eaaat. Don’t ya just love it! I also , loved the movie, and open my eyes as to stop trying to change people, what we can do is ….PRAY and never stop. Just look at what you are teaching and leaving your grandchildren, For Such A Time As This.